Synapses in the nervous system show dynamic behaviour in the transmission of signals from pre- to postsynaptic neuron. The postsynaptic response can decrease (short-term synaptic depression) or increase (short-term synaptic facilitation) during repeated stimulation. In this study, we formulate the theoretical description of the short-term synaptic plasticity in the calyx of Held and analyze the role of the observed dynamics for the processing of sensory information. Patch-clamp recordings of the pre- and postsynaptic elements of the calyx of Held were performed in rat brainstem slices. Experimental data suggest that the dominating dynamic property of this synapse is synaptic depression, originating from the depletion of a vesicle pool by a constant factor with subsequent recovery. The data indicate that the dynamics of recovery cannot be described on a single time scale . The synaptic dynamics can either be modelled as a process with activity-dependent recovery rate  or as originating from two releasable pools operating on different time scales . We compared the performance of two models in terms of goodness of fit to the electrophysiological data. While the dynamics of responses during regular spike trains could be well described by both models, the data on the recovery after the spike trains favour the activity dependent recovery model. Using the models based on the experimental data we analyzed the properties of the synapse from the perspective of information theory. From this point of view, a synapse can be seen as a device transmitting information from sender (a presynaptic cell) to receiver (a postsynaptic cell) and transforming singular input events (spikes) into analogue outputs (post synaptic potentials). We calculated the mutual information between presynaptic spike trains and (predicted) postsynaptic responses. We analytically estimated and numerically calculated optimal stimulation conditions (e.g. an optimal frequency range) for temporal information coding for a given set of synaptic parameters. The results show that, when compared to synapses with fixed recovery rates, activity-dependent recovery extends the frequency range, in which the information about the interspike intervals is coded by synaptic responses (see Figure 1). 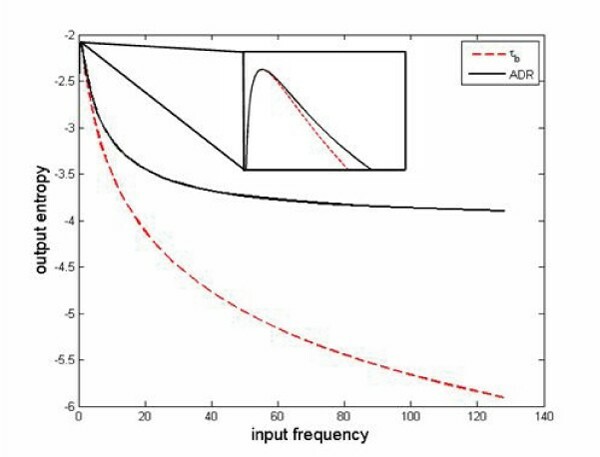 Interestingly, the effective recovery rate as a function of stimulation frequency, estimated from the experimental data, qualitatively agrees with the optimal recovery rate obtained via information theory. We suggest that the activity-dependent recovery can serve as a mechanism for adaptation of synaptic properties to the input statistics and optimization of transfer of relevant information through a synapse. Information contained in postsynaptic responses of a deterministic depressing synapse about the interspike intervals plotted as function of presynaptic firing frequency. Solid line: synapse with activity-dependent recovery rate, dashed line: a synapse with a constant recovery time τ b . We thank Holger Taschenberger for kindly providing the patch-clamp data. Supported by BMBF 01GQ0431.